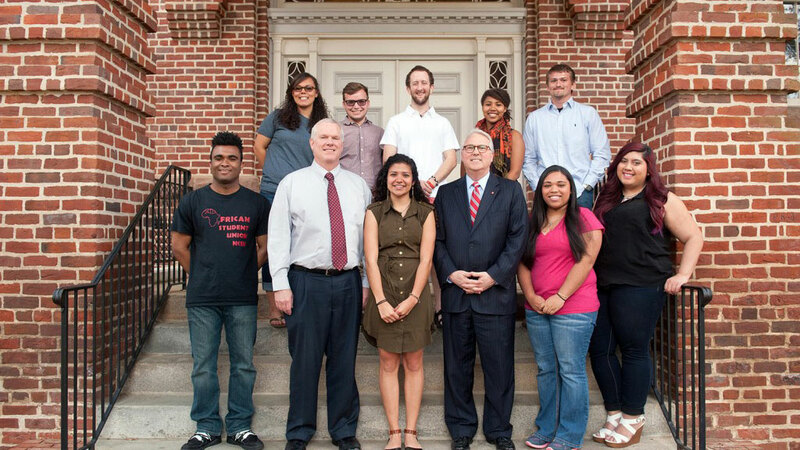 Recipients of the Chancellor’s Study Abroad Scholarship met with Chancellor Woodson in April to discuss the impact of study abroad on their NC State education and goals. For NC State senior zoology major Desiree Outten-Berrios, study abroad provided an incredible opportunity for “a city girl who had never even been out in the country” to work with animals in their natural habitat, at sites including South Africa’s Kruger National Park. Ben Herman, a junior in parks, recreation and tourism management, found himself considering a move to New Zealand after graduation as a result of his eye-opening summer experience exploring natural and cultural resources in that country. And senior Shiana Thomas hopes that her immersion in civil engineering at the Prague Institute, Czech Republic, inspires others back home in Columbus County to gain more confidence in themselves—something that international experiences have done for her. The three were among nine recipients of a Chancellor’s Study Abroad Scholarship for 2014—the program’s inaugural year—who met with Chancellor Randy Woodson in April. The students discussed the impact of study abroad on their NC State education and their goals. Increasing access to international experiences is a strategic priority for the university. In addition to building skills in a particular academic field, study abroad can foster critical skills for working in a global economy, adapting to new surroundings and more. For many students, however, international experiences seem out of reach financially. The Chancellor’s Study Abroad Scholarship initiative aims to narrow that gap. Support has come from the University’s Greatest Needs Fund, which draws on private annual giving to provide the chancellor with discretionary funds to address critical institutional needs and priorities. According to national surveys carried out in 2000 and repeated in 2008 by the American Council on Education (ACE) in collaboration with the College Board, 81 percent of college-bound students plan to study abroad or express a strong desire to do so. Currently, just under 1,200 NC State students study abroad each year; approximately 20 percent of the university’s undergraduates study abroad by the time they graduate. “My hope is that we’ll be able to move more and more money into this effort,” said Mike Mullen, vice chancellor and dean of the Division of Academic and Student Affairs. Mullen told the students at the April session that a semester in England during his own college days made a major impact. “I came from a family background of factory workers, then I went to Europe and it was such a melting pot. I learned the world is an amazing place with amazing people, with infinite variety and perspectives. It forever changed the way I interacted with people,” he said. The chancellor’s scholarship fund also is intended to increase the diversity of NC State’s study abroad participants. Its criteria define the university’s “underrepresented groups” in study abroad as STEM (science, technology, engineering and math) majors; first-generation college students; male students; students who are part of racial or ethnic minority groups; students receiving Pell Grants or with demonstrated financial need; and students who receive disability services. Each 2014 scholarship recipient fell into at least two, and generally three, of those categories, Schmidt said. For the 2015 class, applicants wishing to study in Latin America also received some priority. NC State is a “commitment partner” in the Institute of International Education’s national campaign, Generation Study Abroad. Over the next five years, the university has pledged to increase study abroad enrollments by 50 percent and to increase the participation of students from underrepresented groups by 50 percent. Private donors can make an immediate impact. Part of NC State’s commitment to the institute’s campaign is raising $1 million in endowment funds to provide steady funding for international study scholarships. Other students who discussed their experiences with the chancellor were Lisbeth Arias, a senior in fashion and textiles design; Britton England, a senior in civil engineering; Carlos McClaney, a junior in technology, engineering and design education; Desirae Scruggs, a senior in textile engineering; Donald Skinner, a senior in psychology; and Misha-Elise Tobar, a junior in political science. A 10th scholarship recipient, Jenai Papillion, graduated in December 2014 with a degree in environmental technology and management. Chancellor’s Study Abroad Scholarship recipients are expected to encourage other students to consider international study and help them navigate details. “I’m like the unofficial College of Sciences study abroad ambassador now,” Outten-Berrios noted. The students said they welcomed the chance to answer questions and inspire classmates. To make a donation to help NC State students study abroad, visit https://ccfn.ncsu.edu/advancement-services/giving and select the Study Abroad Fund, under Other Initiatives on the dropdown menu.